Did you know? Chronic poor sleep quality is associated with increased signs of ageing, diminished skin barrier function and lower satisfaction with appearance . According to Sleep Disorders Australia, as we grow older, sleep becomes lighter and more interrupted. This may lead to poor quality sleep that in turn increases the signs of ageing of our skin. However, there are positive steps you can take to improve poor sleep patterns and accelerated ageing. World Sleep Day on March 18 is the perfect time to address sleep-related health and beauty concerns. Skin cell regeneration almost doubles during the night, as the body repairs daytime free-radical damage. By supporting this process with natural herbs such as revered sleep fruit tart cherry, as well as youth enhancing mineral silica, our skin can meet the day refreshed and repaired. Colloidal silica promotes supple skin, healthy hair and strong nails. “It’s important to have both the right quantity and quality of sleep to ensure you maintain your health and appearance,” says Qsilica Brand Development Manager, Jessica Palmer. Palmer also says the skin tends to lose more moisture during the night, whilst you sleep therefore a targeted night cream that also relaxes, is ideal. 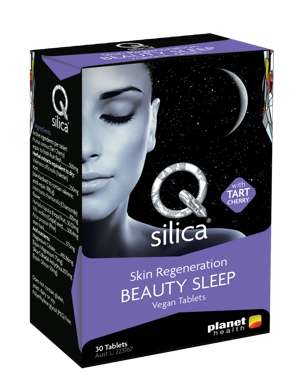 Qsilica Skin Regeneration BEAUTY SLEEP vegetarian tablets with tart cherry, $24.95 RRP, to help improve your sleep quality and enhance skin regeneration during the night, assisting the body’s antioxidant defences to help fight the signs of premature ageing. Take the Qsilica Beauty Sleep Quiz! Are you getting the recommended 7-8 hours of sleep per night? Could your nightly routine include a moisturising and relaxing night cream? Do you wish you awoke refreshed with clear, bright eyes and skin? Is your sleep quality affecting your appearance? If you answered yes to any of the above, try Qsilica BEAUTY SLEEP supplement and night cream duo for improved sleep quality and skin. World Sleep Day is an annual event; a celebration of sleep and a call to action on important issues related to sleep, including medicine, education, social aspects and driving. It is organised by the World Sleep Day Committee of the World Association of Sleep Medicine (WASM) and aims to lessen the burden of sleep problems on society through better prevention and management of sleep disorders.